A Pomme Rose family is distraught as their home was engulfed in flames on Friday afternoon. 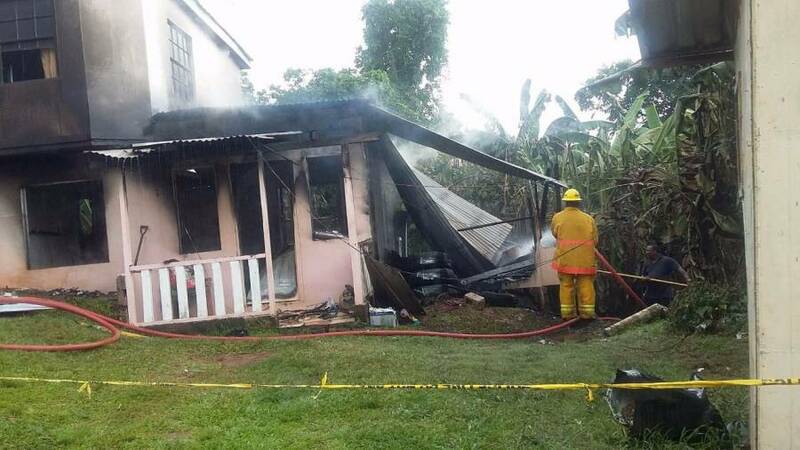 Theresa Jones, one of the occupants of the house said at the time of the incident, she was at a supermarket in Grand Anse, when she received the call from her neighbour. She immediately called her children to break the news, and rushed to the scene. Upon her arrival, she found that the entire downstairs section of the house in flames. Although the upstairs of the house was not entirely burnt, there are some effects such as extreme heat and waterlogged floors. Jones, who was obviously shaken from the news, stated that the cause of the fire hasn’t as yet been determined, neither has the extent of the damage been assessed. “To be honest, I can’t think about it at this time,” she said. The occupants of the downstairs section are her son, his wife and 3 children. Jones indicated that she sometimes sells chicken and chips, and is not receiving a pension from the government. Speaking to Jones’ daughter-in-law Mellisa Charles, she said they lost everything including a sum of money that had been collected for her daughter’s upcoming surgery. Her husband, still in shock said his family would need clothing and a place to stay.